Adorable illustrations. Fun book to teach your children about God while they're learning their ABC's. This book was just beautiful. The illustrations were lovely and the text fit much better than some alphabet style books for the very young that I have seen. It didn't feel forced and told a story. I found that this book even opened the door for conversation and teaching for older children, as well. My elementary students will enjoy touching on the different ways that we can know and be close to God. I received a digital copy of this book from Netgalley in exchange for an honest review. I loved this little book. Alphabet books are a favorite of mine and this spiritual one is very good. I loved the illustrations and the text is short and cute. Great read aloud for preschool through 2nd grade and even older. Each illustration incorporates the shape of the letter for that page (or one of the letters for the page that has both Q and R on it). This is a very nice approach to the ABC's. It is rooted in the Bible and in the qualities that Jesus portrays. I enjoyed having the letters embedded in the wonderful illustrations.I received an ARC in exchange for my honest review. This book was a nice easy read for the little ones done in the style of an alphabet with a letter per page. The pictures are colourful and cute and can see it being a firm favourite. Good children's book. Good list of God's attributes with Scripture references. 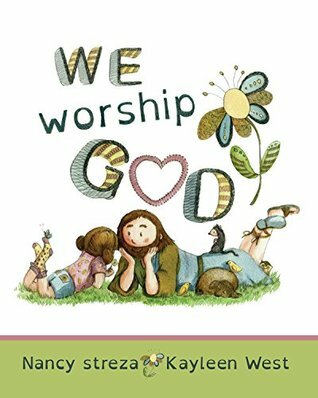 We Worship God by Nancy Streza is a beautiful book for preschool and elementary school aged children. The illustrations are wonderful and really add to the message. This is a very nice approach to the ABC's. It is rooted in the Bible and in the qualities that Jesus portrays. Each page covers a letter to the alphabet. This story not only teaches the alphabet but also about Jesus. I received this ARC from NetGalley and Xist Publishing in exchange for an honest review.